I usually have good luck with the recipes that I make from Around My French Table even the ‘top secret’ ones- but after I put together the 007 top secret chocolate mousse I didn’t like the look of it and I would not describe it as ‘a perfect dinner party chocolate mousse’. I felt like it needed a little something – something in both the looks and texture department, the taste was good but I wanted my mousse to be richer, fluffier and lighter (sounds like an article in Cooks Illustrated). A quick look in my fridge revealed a small container of heavy cream which I whipped up and folded into my flat oily looking mousse, from flat to fluffy (sounds like a commercial for shampoo). Dorie warns us to not overwork our mousse by over mixing the egg whites into the chocolate base, so…next time I will try do better and use a lighter touch. Although if I make this recipe again I would add the whipped cream because my feeling is that chocolate mousse looks better fluffy. I also found my chocolate mousse benefited from spending some time chilling in the fridge before serving. I checked out other recipes for chocolate mousse on the web and it looks to me like pretty much everything in the way of ingredients go, of course-bittersweet chocolate, butter, egg yolks, egg whites, gelatin, whipped cream and even Cool Whip-for a super quick and easy recipe. Which sort of brings me to my question, would you serve chocolate mousse, a good make ahead dessert, at a dinner party? It’s easy, it’s French, it’s chocolate, it’s pretty and it could be served with a cookie. I think it’s one of the classic desserts that we sort of forget about here in the good old USA but let’s face it nobody ever says, ‘oh darn!-it’s that old chocolate mousse again!’, now do they? 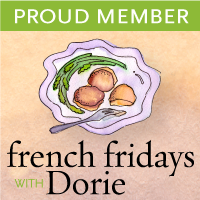 Please check out all the contributors to French Fridays with Dorie with this Friday’s assigned 007 Top Secret Chocolate Mousse from Around My French Table. Gently adapted from Around My French Table by Dorie Greenspan. Place the chocolate in a microwave safe bowl and heat on medium power to gently melt. Gently whisk in the egg yolks and vanilla extract. Place the egg whites in the bowl of a stand mixer and using the whisk attachment beat the egg white and salt until they form soft peaks. Add the sugar and continue to beat until the whites are shiny and hold medium firm peaks. Spoon about one quarter of the whites into the chocolate/egg mixture and whisk until blended. Add the rest of the whites and gently mix in with a rubber spatula, folding in without over mixing. If desired spoon in the whipped cream and gently blend in with a spatula. Spoon the mousse into a serving bowl, or smaller bowls and serve or chill until time for dessert. This looks so incredibly creamy and delicious, Patty! I need to go get a spoon, and claim that secret dishful in the first beautiful photo!!! I like my mousse fluffy as well- good call on the whipping cream. I do think this would be a good “make ahead” dessert for any occasion. No self respecting chocaholic would ever turn it down! Heavy cream can fix just about anything! (If only it could edit my overuse of commas and brackets.) Your mousse looks silky, and rich, and perfect. I would love to serve chocolate mousse at any party, but because my dad was French, it’s just too much pressure. I don’t go near soufflés or crêpes either. This mousse looks incredible – I want to dive in! Love the name of your mousse! Have you seen the new bond movie yet? I am dying to see it. Love all of them. This mousse looks divine and I would have a hard time eating just one dish of it. Patty – your first photo is amazing!!! Nice job! Patty, I’ve always wondered why it’s not recommended that we lick our fingers or spatula when making raw batters or dough, but then a mousse is basically the same – the eggs are raw. Does the chocolate somehow cook the eggs? I’m just wondering because my kids love mousse but I’m not sure if they can handle raw eggs just yet? In any case, your mousse looks fine to me. In fact, they are pretty! Hi Jen, I think it’s rare to get sick from eating raw eggs but I wouldn’t feed chocolate mousse made with raw eggs to kids just to be safe! wow I want to dig in that bowl of creaminess! A mousse James bond would like. I have made mousse, before, and it can be tricky, but yours is gorgeous. Your chocolate mousse looks wonderful! Good call on the whipped cream, I definitely agree that a good mousse should be fluffy. Thanks for sharing! I think I would have like this a lot better with the lightness of whipped cream added in. I probably could have used a lighter hand with the mousse – mine came out looking pretty “flat” too. But it’s good to know that it can turn into something so light and airy! Nice job! Lovely pics with the mint sprigs and all! I failed in the garnishing department on this one. I bought an OPI nail polish from the 007 collection yesterday so I am definitely on board the Bond train – next stop Daniel Craig’s chiseled bod & craggy (but handsome) face! Fabulous twist on this recipe, it looks incredibly rich and fluffy! Love the first pic too. Have a good weekend Patty! Light and fluffy is exactly how I think mousse should be too. Looks great! 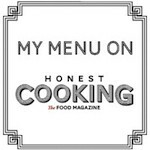 This chocolate mousse sounds divine! Looks wonderfully rich, the perfect end to a meal. Your mousse looks practically perfect Patty. Mine was a disaster. I did find it weird that there was no cream in it – that is how I’d usually make mousse. You can’t go wrong adding whipped cream! The mousses I’ve made in the past had whipped cream instead of eggs. I think I prefer it with whipped cream so I don’t have to wonder about raw eggs. Nice save! You did double duty today!!! No one would ever refuse chocolate mousse around here…and yours is just picture perfect! I like mine a bit fluffier as well…looks wonderful! The cream does make it lighter and creamier. Lovely job, Patty! I’m usually not a mousse fan, but it looks delicious and I want to make it again from scratch myself (instead of eating elsewhere). It looks much lighter and fluffier than ones I had before. YUM! You have definitely uncovered the secret to making & presenting the perfect chocolate mousse! Well done Agent Patty, mission accomplished!! Your mousse looks wonderful. I would usually expect whipped cream in mine, but thought I’d stick with the recipe, and didn’t have any cream on hand, so couldn’t improvise. But great adaptation! And beautiful presentation. Mine was actually a hit, but I think I’d like yours better! Your mousse looks perfectly fluffy, Patty. Your mint garnish is an elegant touch. I’m thinking that a bit of mint extract would be nice too. I definitely think that guests would find this to be a treat, and never realize how easy it is. That would be the 007 secret. I plan to serve it at my next dinner party. I blinked and missed this one, I don’t know how because chocolate mousse is a delectable favorite treat. Looks so rich and delicious I can taste it. Hi Patty, Sorry I’ve been MIA lately….we’ve been away for 6 weeks and then came home to Sandy! Looks like you’ve been making some great dishes! Really loving your Chocolate Mousse! So creamy and light looking! We really loved this and it was quite easy to put together. Another keeper from Dorie! Hubby loves mousse. Yours looks so creamy and velvety Patricia. we’re having guests for dinner this coming Friday, maybe make this for them since they are not big cake eaters. Your mousse is picture perfect! As you know, Patty, I didn’t make the mousse last week – a Mary-mix-up, so I intend to make it tomorrow. What I know for sure, sure, sure is that I am very heavy-handed so I will try to “go light.” I honestly thought your mousse looked perfect, light, fluffy, everything a mousse should be. And, what you are correct about is that handly anyone ever gets tired of chocolate especially in mousse form.